First, let's get something straight. This is really a Psion machine. 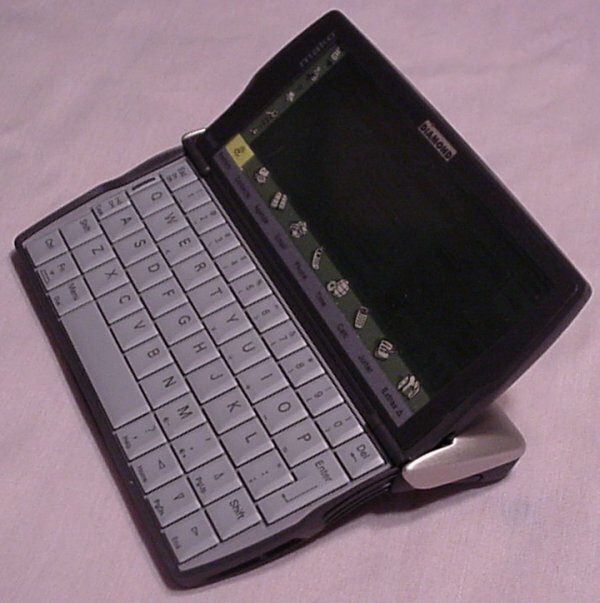 It's a Psion Revo, but was simply re-badged for the U.S. market. That said, it's really cool. It's a Palm/Pilot killer, except for one little battery-related problem. OS-wise, it runs the latest version of the Symbian OS, which runs fast on teeny tiny pieces of hardware. The screen is small, but very sharp with great contrast. (And I have a Palm Vx, so I know sharp contrast when I see it.) The keyboard it small, but actually offers good feedback. I can't touch-type on it, but I sure can do well using my thumbs. 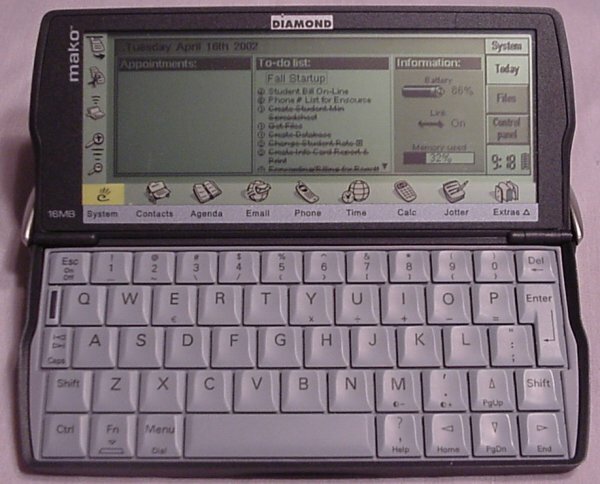 Application-wise, it's much more like a mini-sub-palmtop than a Palm/Pilot type of PDA. That's both good and bad. You can do real word processing on it. And real spreadsheet. It can even run a Perl interpreter, allowing you to hack and test code on the road. But other apps, like the to-do lists and calender/alarm features, are more complicated than they need to be. It gives them extra capabilities, but makes it difficult to quickly use them. So why are these obsolete? Well, number one, Psion has left the consumer handheld computer business. And number two, the batteries have big problems. When new, they hold a charge a long time. But there's a flaw in the charging system that can easily lead to overcharged batteries. This hurts the batteries and speed their discharge rate. Which makes you need to recharge them more, which leads to more chances to overcharge, and so on and so on. If only these things used AA or even AAA batteries, they would be nearly perfect. Side view. Note how the keyboard slides out. Closed view. When closed, the keyboard slides back, making for a very compact unit. Click here to view all comments for the Diamond Mako and to leave your own. Click here to view comments about other Diamond computers.